Born in Liverpool in 1958, Emrys Williams moved to Colwyn Bay in north Wales when he was eleven. He trained at the Slade School of Fine Art in London, before embarking on a career in teaching. Emrys creates a very personal world in his paintings based on memory and imagination. Silent, mysterious characters, huddled under umbrellas, hover at the edge of the pictures. 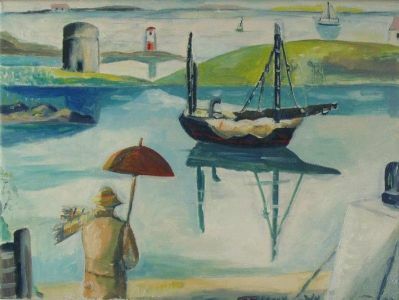 Lighthouses, trains, and distant boats and ships, are all part of the basic vocabulary of his paintings, forming part of the narrative set within coastal scenes, which are familiar to him. Elected to the Royal Cambrian Academy in 1997, Emrys won the Gold Medal for Fine Art in the 2007 National Eisteddfod of Wales.